As Meghan and Alexander finished up their final undergraduate semester at the University of Notre Dame, little did they know they were about to earn a degree…and a partner for life! Meghan and Alex were married in a Catholic ceremony surrounded by their friends and family at Our Mother of Good Counsel. Allure Films began our day of filming this joyous occasion with the bridal party prep. When Meghan had to make the decision about who she would ask to be her matron-of-honor, the answer was clearly a no-brainer: it would be both of her sisters, Mary Lauren and Katie. Do these ladies look familiar? That’s because Allure Films had the honor of filming Mary Lauren and her husband Derek’s wedding a few short months ago! Now, on Meghan and Alex’s big day, we followed the couple from there ceremony to a reception at the Overbrook Golf Club, where it is always great to work with Jimmy and his amazing team. No Overbrook Golf Club wedding is complete without the bride and groom getting outdoor photographs together. M2 Photography took beautiful photographs of the happy newlyweds on the club’s beautiful landscape. The reception was a fun time filled with speeches made by the bride and groom’s immediate family members along with dancing to BVT Live’s incredible Big Ric Rising Band. Alexander and his groomsmen even treated the guests with a song performance! Congratulations Meghan and Alexander! May your joining together bring you more joy than you can imagine! Your wedding day isn’t just some ordinary day in the books. For Mary Lauren and Derek, it was a day that they’ll never forget! Allure Films joined Philip Gabriel Photography at Overbrook Golf Club, where Mary Lauren and Derek were each getting ready in separate rooms. We captured several touching moments of the bride and groom reading one another’s letters before the ceremony, and receiving help from their family and friends to strap up shoes, button up dresses, and tie bow ties. Mary Lauren and Derek said their “I Do’s” in a traditional Catholic wedding ceremony in front of their loved ones at Saint John Neumann Parish in Bryn Mawr. After the vows were exchanged and the newlyweds were announced, everyone made their way back to Overbrook Golf Club to kick off the party with an outdoor cocktail hour over the 18th Fairway. Overbrook Golf Club provided an incredible natural landscape where the team from Philip Gabriel Photography was able to snap some jaw-dropping romantic shots of the bride and groom. Just as stunning was the décor in the ballroom, where Petah Bashano Event Design had pulled out all the stops with their floral centerpieces and romantic candlelit tables. After a delicious meal, guests of all ages danced the night away to the upbeat tunes performed by the Don Eaton Band. There was never a moment when the dance floor wasn’t packed! Mary Lauren and Derek, here’s to your wedding day and a lifetime of more extraordinary days ahead. 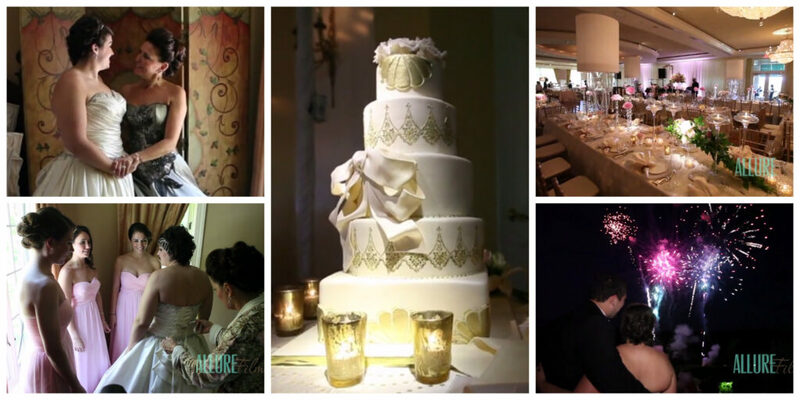 Click here for more information on Allure Films’ wedding videography packages. Let’s head on over to Overbrook Golf Club for a glimpse into Danielle and Michael’s magical day. This location is stunning as is, but we were blown away by Petah Bashano Event & Floral Design‘s beautiful decor. From beginning to end, Danielle and Michael’s big day was full of heartfelt moments and joy. Even the crowd was teary-eyed during a few special moments. We are grateful that we got to be a part of this exciting day. Philip Gabriel Photography was also there to capture each moment as it unfolded. Congrats Danielle and Michael and thank you for allowing Allure Films to document the magic! Looking for the perfect wedding videographer for your wedding? Contact Allure Films for more information on our services! Join Kara & Hawley on their beautiful wedding day!